Sealing adhesive based on a solvent-free acrylate and cementitious powder. for adhering and sealing overlaps of Schlüter-KERDI waterproofing membranes. Also used to adhere Schlüter-KERDI-KEBA sealing band over the joints of abutted membrane pieces and tile backerboards. MS polymer-based elastic adhesive, for adjoining profiles and Schlüter-KERDI-BOARD as well as sealing the abutments and joint areas of membrane sections. Waterproofing polyethylene band for sealing joints in a bonded waterproof assembly, eg. matting connections and wall to floor junctions. Flexible polyethylene waterproofing strip, used to seal movement joints. Set for secure waterproofing connections between building components (eg. shower trays and bath tubs) and Schlüter's waterproofing systems. 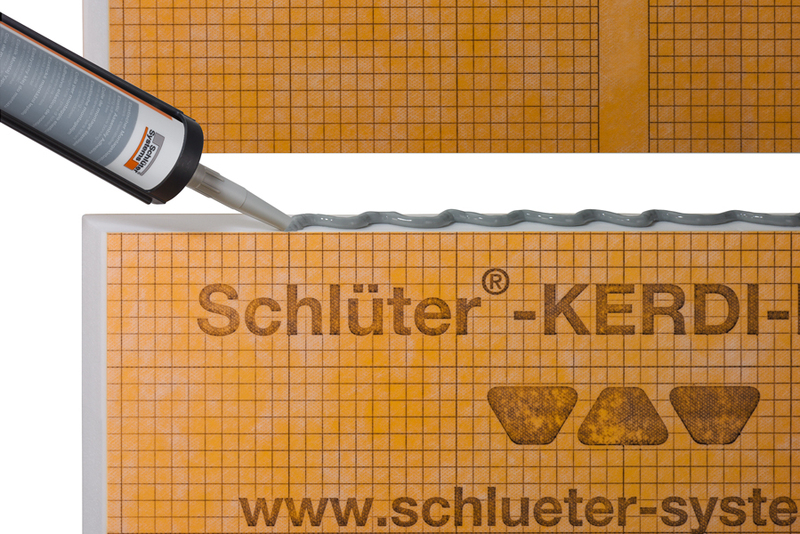 Extension pack for the Schlüter-KERDI-TS waterproofing set, including a 120 x 120mm waterproof polyethylene collar and a corner installation piece. Flexible polypropylene profile for use behind silicone joints, to protect the waterproof connection seal during silicone renovation. Self adhesive tape for reinforcing the joints of Schlüter-KERDI-BOARD tile backerboard, before the application of trowel-applied covering materials or plaster. Anchor for reinforced fixing of Schlüter-KERDI-BOARD tile backerboard to substrates. Washer for the attachment of Schlüter's cement-free tile backerboard to stud frame structures. Installation screws for the attachment of Schlüter's cement-free tile backerboard to stud frame structures. Prefabricated pieces to quickly and neatly waterproof internal and external corners. Prefabricated pieces to quickly and neatly waterproof shower tray to floor transitions. Circular prefabricated collar of waterproofing membrane for tanking around pipe openings.